This homeowner got tired of choosing between a lot of watering and an ugly yard. 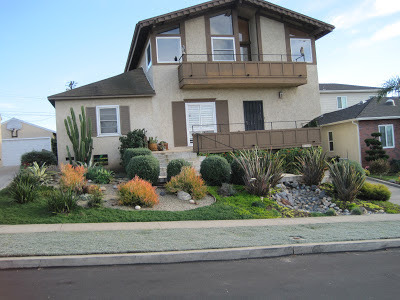 In Fall of 2008, they hired Eco-nomical Landscape to design and install this drought resistant garden. Installation of cacti, California Natives and other drought resistant plants eliminated the need to make a choice. They water this lovely garden once a week--sometimes less, depending on the rain. They also have a solar heated pool in the back and will be happy to share information on that!